Today was Day #6 of Chocolate and Coffee Theme Week. 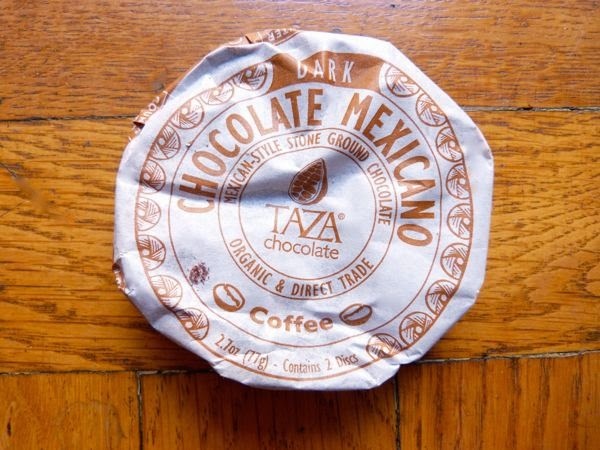 If you feel like you need a morning pick-me up, try one or two of these robust, stone-ground, dark chocolate discs from Taza Chocolate (Somerville, MA). 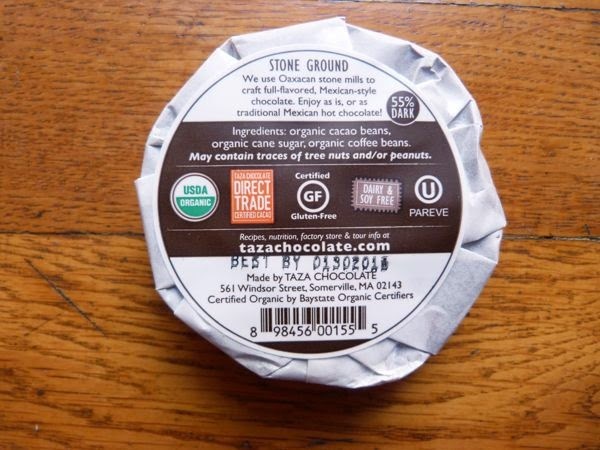 Carefully swaddled in paper (shown front and back at right), made with Certified Direct Trade beans, and infused with the subtle, almost fruity flavor of Counter Culture Coffee, the two Mexican Dark Coffee discs in one package consisted of several wedges, making it easier to break-off the desired amount to make your drinking chocolate. Of course, instead of mixing up some drinking chocolate, you can always eat this chocolate straight up; this is what I did today. Apologies to Taza Chocolate, this Coffee package was affected by hot sun. The round package normally looks much more crisply circular than this one.